BaitRageous: One earring short of a full lobe! One earring short of a full lobe! A story about women, fishing and earrings, yep earrings. 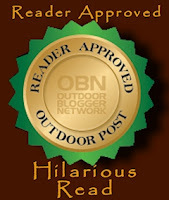 I did this blog over a year ago and even got a reader approved award from the Outdoor Blogger Network. Read on my friend and we will see you at the end. IT ALL STARTED the other day when I could swear my wife was wearing a pair of my spoon fishing lures. At that moment I had an epiphany or I think that is what it was, but it could have been that chilli-burger yesterday. I digress and hopefully digest, too. This got me to thinking about how much women’s earrings resemble fishing lures. In fact, I think some of my wife’s earrings could be hanging in Bass Pro, if only they had a treble hook. Ah, you don’t think the earring manufactures have infiltrated the lure industry and are now making lures do you? If this is true, I’m not sure who will be more embarrassed, me who would be fishing with women’s jewelry or her wearing fishing tackle. Wait a minute, I could save lots of money because she would wear it for a while and then I could fish with it, cool, dual purpose and environmentally friendly. I think I just invented a new product, Earring Tackle. Think about what a great Birthday gift this would be for your wife. You just drop by Bass Pro, go to the Earring Tackle, pick out that perfect earring lure, have it wrapped, and present it to her on her birthday. I bet she would say" Holy Crappie" and would love it!!!!!! Later as she grows tired of them, you will end up with a new lure and you might be able to say "Hey Babe, I caught a 3 lb. Crappie with your birthday present." How bout dat? To make life short, I decided that I had to test this earring tackle concept to determine if fish can actually be caught on jewelry, so snuck in to my wife’s jewelry box to see what I might find. Wow, a jewelry box and a tackle box are nearly the same. Who said men are from mars and women are from Venus. Anyway, I noticed that nice spoon I spoke about earlier that I have been eyeing. I wondered, will she allow me to add a treble hook? You never know until you ask, right? I realized that trying to talk her out of her spoon earrings would be like trying to talk me out of my rooster tail, no way. 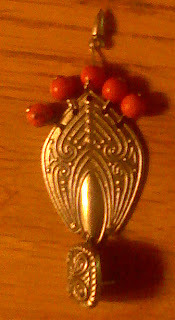 Surprise, Surprise, she allowed me to take her spoon jewelry and turn it into Earring Tackle. Here's a photo of my future tackle just need a treble hook. Not bad, eh. I wondered what kind of fish enjoys women’s earrings. My next step is to fish with it. Fast forward a week and here I am, on the river, sitting in my kayak with my fishing pole in hand and earring tackle knotted on my line. The first cast was good, nice weight, easy hitting target, runs about 2 inches below water, and shiny, but very little action. That could be an issue. 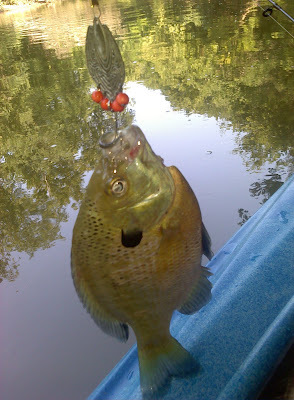 However, it looks like a fish could confuse it for last months, 13 year cicada with those big orange eyes. Cast 2, 3, 4, 5, 6,…..15 and I’m starting to get a little concerned, 34, 35, 36 and bang, I get a bite. I start to reel and notice that the fish seems to be small but a fighter. Could it be a Largemouth, Smallmouth, Rock Bass or Catfish? Here it is my first fish catch on jewelry tackle. I have answered the question; you can catch fish on your wife’s jewelry. Now I find myself staring at women and thinking, WOW I wonder what I could catch with those earrings. I have found that you don’t stare too long or the women run off. Did you know that there’s a store called Clarie’s where you can buy 10 earrings for 10 bucks, 20 lures for .50 cents each? Dang, this could be big, imagine Claire’s Earring Tackle Fishing Tournament. I can see it now, the winner of the Earring Tackle Fishing Tournament caught the winning fish, a 9 pound largemouth, on a pair of his wife’s danglers. In closing I would like to say-- Hi, I’m Larry and I like women’s jewelry......... to fish with. Sometimes it’s good to be one earring short of a full lobe. I hope you enjoyed the humor! Remember: Life's Short, get away from the big screen and get on a big stream! First, the earring lure has been out there for years. Just go to the Fisherman's Expo next year and look around. Second, if I were to dig into my wife's jewelery box looking for earrings to make lures, I would be a one handed fisherman. On the other hand, I do enjoy your humor and notice, I'm typing with two hands. Sure enjoyed this post the first time around, and, just re-read it and it still appeals to me. Wonder where this is all going too. I mean we want women's earrings for lures, and, the women want our fly tying feathers for their hair! Thanks Mark (Shoreman)! Yep, I don't have any knives in the house. Well Mel, a good women wants both. Hey, hope you and your family stay safe from all the fires in Colorado. The hottest tackle innovation of the year!